So lately it seems like I have been making A LOT of cake pops! They have become my new thing. I love making them. When I tell people about them they never seem to understand what I'm talking about. A cake pop is a small little treat made of cake mixed with frosting and molded into almost any type of shape. It is next dipped in candy coating and decorated with a variety of sprinkles, nuts, bright colored candies, etc. I make them for all occasions (birthdays, office parties, holidays, baby showers, themed parties) you name it I can probably make it. 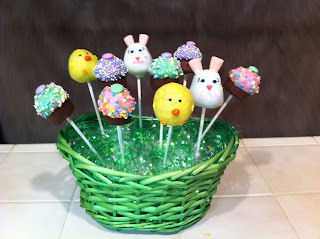 With Easter just around the corner I have decided to make Easter themed cake pops (Easter Eggs, Chicks, Bunnies and Spring colored Cupcakes). The prices below are good for all cake pops that I make. I am now offering cake pops arranged in baskets or other containers. E-mail or call me for more details dabeyta@hotmail.com or 805-720-0327. Also keep in mind that I also make other tasty treats. You request it and I'll make it!